In order to bid on a house you must have current premium time. Bids are placed using premium cards. Should someone outbid you the premium cards will return to your depot and you can re-bid a higher amount immediately. From the first bid, the bidding period will last 48 hours. Be sure to have enough gold in your bank account to pay for rent should you win a house bid! Remember that, all houses have a monthly rent which is paid directly from your bank balance. If you do not have enough money in your bank at the time of the rent payment, you will immediately lose your house and it will be put back on auction. Any items in the house will be transferred to the house owner's depot box. House rent varies and is based on the size of the house. Invite List determine who may enter the house. 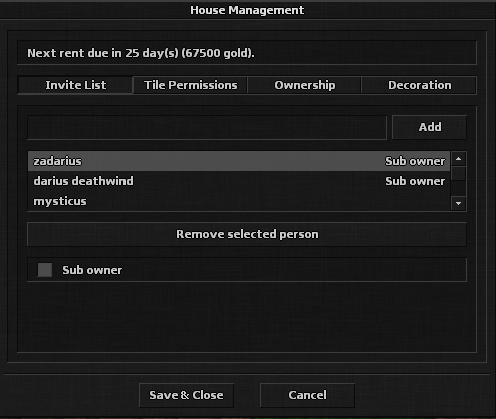 You may also set 'co-owners' here which allows those people to modify all aspects of the house such as invites, door permissions, etc. Tile Permission determine who may open and close each door. You must stand in each doorway individually and set this. A co-owner may also set this. Ownership you may abandon your house or trade with another player here. Decoration buy some things to make your house your own! The current owner of a house may initiate a house transfer or trade by typing /house while standing inside their house. Access the 'Ownership tab', enter the Transfer To character and the transfer amount. Trades must be done in gold coins. The buyer has 2 hours to accept and must have the proper gold amount in their bank. Rent is due every 30 days. You must have the money in your bank. Rent amount and due date can be seen in the /house window. You do not have to have maintain premium time after purchasing the house. You must log in at least once every 90 days, or you will lose your house. If you lose or trade your house - all items will return to your depot.